Studio lessons often gravitate toward being ‘fix-it’ sessions: straighten the posture, correct the notes and rhythms, get the bow in the right place, and insist on dynamics—until the next lesson when we do it all again, hopefully making progress. But every music teacher yearns for enough time to explore those more transcendent ideals that resonate closer to our hearts: to seek the meaning of great music, to share profound ideas and experiences, and to cultivate our students’ innate potential. While these are lofty goals, there are specific, practical, and effective ways to work toward these higher priorities with students. 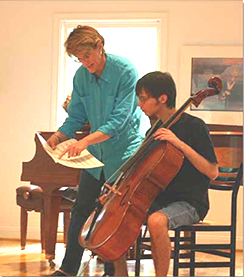 My goal as a teacher is to constantly explore ways to guide each student towards self-discovery and enlightened thinking—so as they learn the cello they also learn transferable skills that not only help them play their best but be their best. My goal as a colleague is to encourage other teachers to identify their highest priorities and explore ways to bring those priorities to the forefront of their own teaching.